As we move into the month of November we're approaching the end of Season 1, Walt being taken by the Others, and the Hatch being blown open. The beginning of November actually ended up being a pretty important time, and I think we'll probably spend a few episodes just getting through it. But, before we get to that, we pick up where we left off with Jack and Sayid exploring Rousseau's now blown up hideout. Hurley gets separated from Charlie, and is confronted by Rousseau, where he learns where the numbers come from, as well as how Rousseau ended up on the island. Locke makes a crib for Claire, Charlie admits his heroin addiction to Hurley, and Hurley tells Charlie that he's worth $156 million. As a follow up to our discussion about Ethan and Goodwin, Ben takes Juliet out to see Goodwin's body, which has clearly been there for a while. Boone and Locke continue to try and find a way to break open the hatch, while Jack helps Sawyer get some glasses to help his headaches while reading. Locke has a dream, and that leads he and Boone to Yemi's plane. We get a split screen of Boone in the plane, trying to get the radio to work, while over at the tail section Bernard is using his radio to try and communicate with someone. This ended up being quite the audio nightmare, because the two radio conversations didn't quite line up with each other time-wise, so I had to try and work it so one scene's audio faded out while the other scene's audio was playing, so that you could hear each person speaking in person, and not on the radio. 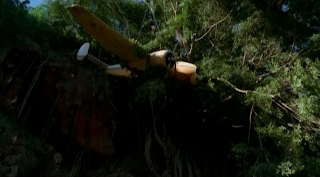 Anyways, the plane slides off the cliff with Boone in it, and crashes to the ground. Ana Lucia and Eko have a heart-to-heart, and we get another 'meh' mobisode, where Jin loses his mind after losing in golf to Michael and Hurley. We finish the episode with Locke bringing Boone to Jack, then taking off. This episode is 46:38 and is 384MB to download. You can stream below (via Facebook), or go here to use torrents (better quality, recommended) to download the episodes to your computer. OMG. I ABSOLUTELY LOVE THESE!!!! Boone, Ana Lucia, Juliet, Bernard, Rousseau, Ben and Eko - all in the same episode?!!!! AAAAH. Its soo good. I would pay lots of money for a DVD boxset of this!!!! Can I ask, if you have already done all the editing, which episode was the hardest for you to do?? Is there any episode that features a huge amount of characters?? This might not be making any sense, sorry!!! I'm almost expecting some of these characters to meet at some point (Ana and Juliet??) Knowing full well that they never do!!! Hahaa!!! LOST is amazing. This is amazing. HAHAHA. @Ttom I would say that the hardest episode (actually episodes) were the two that covered the day of the crash (Episodes 025 and 026). The fact that the day September 22, 2004 was shown to us in episodes that spanned the first three seasons of the show, it took a considerable amount of work to get all of the clips together, and then to put them into some kind of order that made sense, and make sure everything flowed from one scene to the next. I loved how it turned out, but it was definitely a lot of work. And that's probably the answer to your second question as well. Those two episodes I believe features all of the main survivors (including minor characters like Arzt and Nikki & Paolo), features all of the relevant Tail Section characters except maybe Nathan, and also features Desmond, Inman, and a good number of the Others (Ben, Juliet, Goodwin, Ethan, etc.). So yeah, I'd say that's probably the mother load right there as far as collection of cast characters goes.